Johan Lenhardt Karg, born 1666 in Germany and died in Mannheim, Baden, Wurtenburg, Germany. He married Ursula Ohneberg on April 27, 1679 in Schwaben, Bavaria. She was born November 24, 1653 in Schwaben, Bavaria. Leonhardt Karg was born in 1695 in Germany and died in Germany. He married Magdalena Meyers on May 7, 1715 in Pfalz, Bavaria. She was born, 1699 in Germany and died January, 1780 in Germany. Johan Leonard Karg was born October 1, 1720 in Mannheim, Baden, Wurtenburg, Germany and died 1768 in Philadelphia, Delaware County, Pennsylvania. He married Margaretha Schmidpeter in 1748, Ettenstatt, Bayern, Germany. She was born 1722 Germany and died in 1816. Wilhelm (William) Cart was born 1748 in Philadelphia, Delaware County, Pennsylvania and died 1829 in Virginia (WV). He married Maria Catharina Heppenheimer in 1780, at Philadelphia, Delaware County, Pennsylvania. She was born in 1752 in Douglas Township, Montgomery County, Pennsylvania, and died in 1820 in Greenbrier County, VA (WV). William is buried at Carte Family Cemetery, Big Chimney, Kanawha County, West Virginia. Maria is assumed to be buried in Greenbrier County, West Virginia. Conrad James Cart, was born March 6, 1782 in Douglas Township, Montgomery County, Pennsylvania and died March 30, 1853, at Charleston, Kanawha County, Virginia (WV). He married Mary Ann Vance on August 20, 1807 in Monroe County Virginia (WV). She was born March 6, 1782, in Monaghan, York County, Pennsylvania and died January 24, 1863, in Kanawha County, Virginia. Conrad & Mary are buried at Carte Family Cemetery, Big Chimney, Kanawha County, West Virginia. John Wentz Carte was born January 18, 1815, Greenbrier County, Virginia and died October 11, 1872, In Kanawha County, West Virginia. He married Delilah May Jarrett on July 4, 1839 in Kanawha County, Virginia (WV). She was born July 22, 1818, in Kanawha County, Virginia (WV), and died March 7, 1908 in Elkview, Kanawha County, West Virginia. John & Delilah are buried at Jarrett Cemetery, Elkview, Kanawha County, West Virginia. 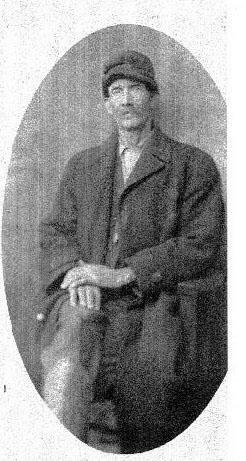 John Robert Carte was born November 25, 1851 in Kanawha County, Virginia (WV) and died April 2, 1927 in Elkview, Kanawha County, West Virginia. He was a farmer. He married Sarah Katherine Acree on January 9, 1882, in Gallia County, Ohio. She was born November 19, 1863 in West Virginia and died August 23, 1957, in Elkview, Kanawha County, West Virginia. John & Sarah are buried at Jarrett Cemetery, Elkview, Kanawha County, West Virginia. John Morgan Carte was born February, 2, 1887 in Elkview, Kanawha County, West Virginia and died May 15, 1951, in South Charleston, Kanawha County, West Virginia. He was a pipefitter. He married Erra Mae Douglas on December 25, 1914 Kanawha County, West Virginia. She was born June 29, 1892 in Charleston, Kanawha County, West Virginia and died May 8, 1964, in South Charleston, Kanawha County, West Virginia. John is buried at Jarrett Cemetery, Elkview, Kanawha County, West Virginia, and Erra is buried at Montgomery Memorial Park, London, Kanawha County, West Virginia. Katherine Rahama Carte, born March 29, 1917 in Akron, Summitt County, Ohio, and died January 19, 2000 in South Charleston, Kanawha County, West Virginia. She married Holly Roy Edwards on May 7, 1937 in Winfield, Putnam County, West Virginia. He was born September 3, 1917 in Quincy, Kanawha County, West Virginia and died March 15, 1977, in Charleston, Kanawha County, West Virginia. Holly & Katherine are buried at Tyler Mountain Memorial Gardens, Cross Lanes, Kanawha County, West Virginia.